On the southern slope of California’s San Bernardino mountains, there is a large rock formation shaped like an arrowhead. A Native American legend states that an arrow fell from heaven and burned the design into the mountain side to guide tribes to healing waters. In 1894, Seth Marshall began bottling spring water in the basement of the hotel that sat at the base of the mountain. In 1905, Marshall began shipping his bottled water to Los Angeles and other California cities. 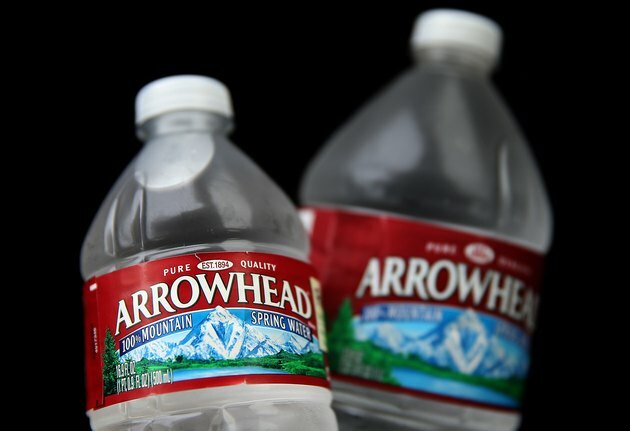 More than one hundred years later, Arrowhead bottled water is distributed throughout California, the Rockies and the Pacific Northwest. Arrowhead bottled water, like tap water and other brands of bottled water, is a calorie-free beverage. There isn’t any fat, protein or carbohydrates present in Arrowhead bottled water. Although water consumption is necessary for optimal health, it does not provide the body with energy in the form of calories from macronutrients. According to Arrowhead’s December 2009 water analysis report, there are 5 minerals present in Arrowhead Mountain Spring Water. Arrowhead bottled water contains, on average, 10 to 49 mg of calcium per liter of water. There is also 1.6 to 3.8 mg of potassium, 3.4 to 19 mg of magnesium and 0 to 1.3 mg of fluoride. Lastly, there is 10 to 20 mg of sodium per liter of Arrowhead Mountain Spring Water. Arrowhead Mountain Spring Water bottles their water from a variety of water sources in order to accommodate the demand for their products. In the beginning, all of Arrowhead’s water came from 5 boreholes in the southern San Bernardino mountainside, where the large arrowhead formation can be seen. Now, Arrowhead bottled water comes from a variety of water sources that stretch from the United States up into Canada. Although they gather water from different sources, each source is chosen for its mountain spring water. Arrowhead provides over 10 bottled water products, from five-gallon containers for the family or office to individual 8-oz. or 1-liter, on-the-go bottles. It recently developed an Aquapod bottled water for kids. It is 11 oz. and and almost completely spherical. It also recently came out with a more Eco-friendly bottled water product. It is half a liter and according to the company's bottled water quality report, contains 30 percent less plastic than the original half-liter bottle. Around 60 percent of your body weight is water. Water is essential for life and good health because every part of the body is dependent on its presence. According to the Mayo Clinic website, water is responsible for a variety of purposes, including flushing toxins out of your organs, transporting nutrients within the body and maintaining the desired moisture level in certain tissues, such as in your nose, ears and throat. Dehydration results from insufficient water consumption and can, even when mild, affect certain cognitive functions and your overall level of energy. Mayo Clinic: Water — How Much Should You Drink Everyday?